Everyone knows that argan oil is great for hair and the number of hair care products featuring the miracle oil as one of its top ingredients on shelves today has bloomed. But did you know it is also amazing on skin as well as it has extremely high levels of Vitamin E and 80% fatty acids which make it perfect for softening skin, soothing minor irritations as well as protecting against premature aging caused by oxidation? When I found that the latest handcream from MOR contains a high concentration of this miracle oil, I knew I needed to literally get my paws onto them. I am a sucker for packaging and MOR always does one of the best packaging out there. This time, before even digging into the product, the box had already won me over. Borrowing themes from the bygone art of sending hand-written mails for the Correspondence range, the box is showcased with a stamp sheet print design, accented by traditional trims and a colour-coordinated beeswax monogrammed seal to give it that special hand-pressed touch. It evokes a very romantic feeling with soft pastel colour. Packed full of argan oil (it's the 2nd ingredient in the listing!) which assists with premature ageing and a blend of Artichoke Leaf Extract, Shea Butter and Rooibos Extract to rejuvenate and smoothe hands as well as boost the anti-oxidant factors. A rich cream, it is easily absorbed by dry hands and fingers, and a little goes a long way. The aluminium tube makes it easy to dispense the product out and I like to rub a pea size amount into my finger tips and cuticles as those are my driest parts before working a bit more of the cream onto the rest of my hands. Once absorb, it leaves a light sheen on skin, smoothing and softening tired dried hands and give a soft and silky feel. The shea butter is really awesome especially during winter when my skin gets dry and scaly and I use it on my dry elbows as well. Available in 9 fragrances, I love the Sencha Verbena which reminded me of aromatic lemon grass while Tangelo Grapefruit is a refreshing blend of neroli and orange essential oils. Both scents lingered lightly on skin even after a period of time which I really enjoy. If you are after a great hand cream this winter with wonderful scents, be sure to look out for these when you next visit a nearby counter. I know I'd be picking up another tube with a different fragrance when my current one runs out. RRP A$26.95 at Myer, David Jones stores, gift boutiques and MOR online. This hand cream sounds lovely! 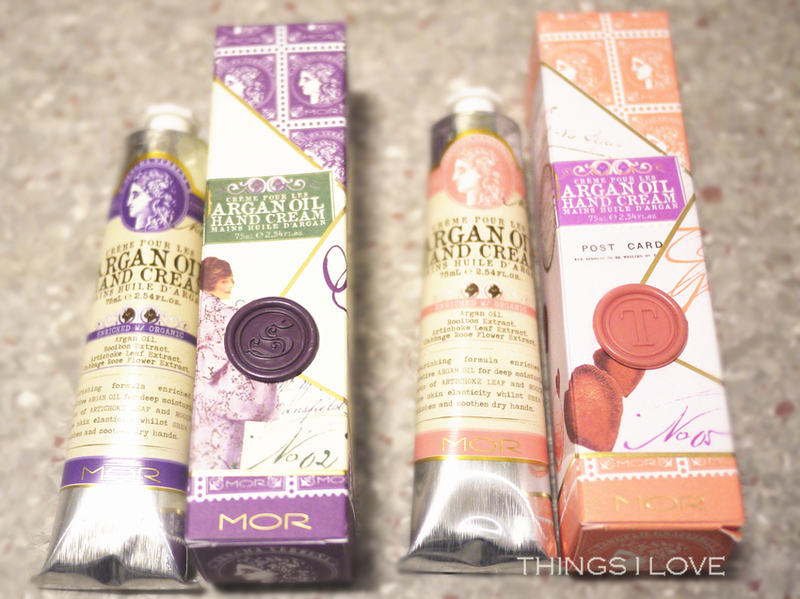 I adore products by Mor, they always smell delicious and have cute packaging!